We are delighted to offer this stunning contemporary detached family home set on a corner site, to the open market! Situated within this popular and convenient development on the outskirts of Saintfield, this is a home that will attract a range of discerning buyers! The accommodation is bright and spacious throughout, featuring an extensive range of top quality finishes. 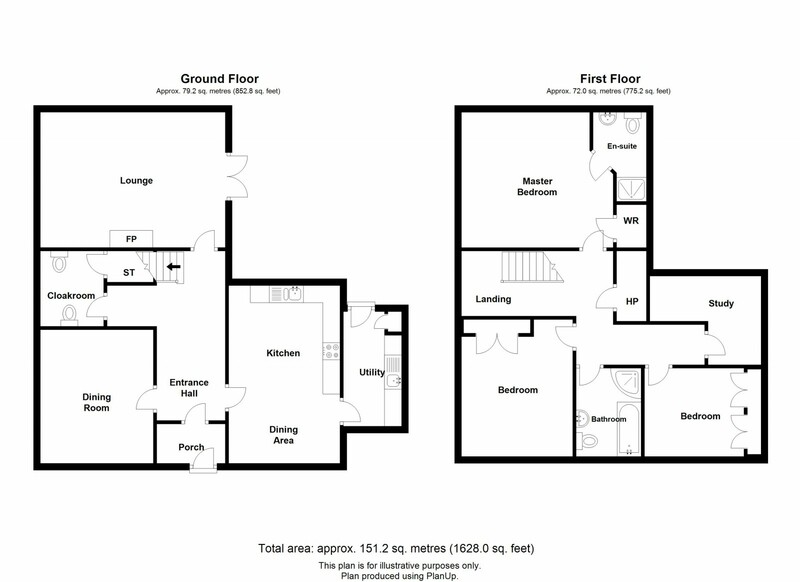 The ground floor hosts reception porch and hallway, modern beech fitted kitchen open plan to dining area, utility room, family room and sitting room with double doors to a courtyard patio area. The first floor comprises of four well-proportioned bedrooms with an excellent range of fitted shaker style bedroom furniture, whilst the master bedroom benefits from en-suite shower room. A white four piece bathroom suite completes this beautiful home. Externally, a detached matching garage with ample brick paved driveway is located to the side, whilst a private and low maintenance courtyard style patio area is situated to the rear. This home is ideally situated for a quick commute into Belfast, Lisburn or Downpatrick, and with an excellent selection of primary, secondary and grammar schools all within easy reach! Painted hardwood entrance door with matching glazed side panels; ceramic tiled floor; wood panelled and glazed entrance door. Solid oak ship fixer; telephone connection point; beam vacuum point. Modern white suite comprising semi pedestal wash hand basin with chrome mixer tap; dual flush wc; solid oak strip floor; under stair storage. Excellent range of cream built in units to include storage cupboards; shelving with tongue and groove panelling and television display recess. Fabulous contemporary range of beech fitted high and low level units with grey fleck corian worktops to include Franke 1½ tub single drainer stainless steel sink unit with mixer tap; Neff electric eye level oven and grill; Neff electric ceramic hob; modern stainless steel extractor hood over; large integrated; Hotpoint fridge/freezer; Hotpoint integrated dishwasher; folding glass display cupboard; excellent range of drawers; grey ceramic tiled floor; television aerial point. Contemporary beech fitted units with corian worktops; single drainer stainless steel unit with mixer tap; plumbed for washing matching; space for tumble dryer; grey ceramic tiled floor; PVC double glazing door to rear. Stovax cast iron, multi fuel store on slate hearth modern white tile surround; solid oak strip floor; TV connection point; double doors out to rear patio area. Low voltage spotlights; security alarm keypad; beam vacuum point; access to roofspace. Excellent shelving and clothes rails; radiator. Excellent range of modern shaker style cream fully fitted furniture to include full length wardrobes and built in shelving and drawers; TV connection point. Modern white suite comprising fully tiled shower cubicle with &apos;Aqua therm&apos; shower unit; glazed door; semi-pedestal wash hand basin with mixer taps; dual flush wc; part ceramic tiled walls; ceramic tiled floor; heated towel radiator; cream shaker style built in unit with mirrored door and internal shelving. Modern white bulit in furniture to include full and ½ length wardrobes; shelving and range of drawers; television connection point. Modern white four piece bathroom suite to include ceramic tiled panelled bath with mixer tap and telephone shower attachment; separate fully tiled corner shower cubicle with Aquatherm shower unit; chrome / glazed sliding doors; semi pedestal wash hand basin with mixer tap; dual flush wc; good range of cream shaker style fitted units with shelving and mirror fronted cabinets over sink; fully ceramic tiled floor; part ceramic tile walls; heated towel radiator. White shaker style fitted bedroom furniture to include full and ½ length wardrobes; shelving and excellent drawers; TV connection point. Cream shaker style built in desk with cream worktop and drawers; telephone connection point. Gas fired boiler; sliding up and over door; PVC side entrance door; light and power points. Fully enclosed private rear patio area with gravelled raised beds with mature shrubs; secluded gated entrance to rear of garage with calor gas tanks / bin storage area: paved pathways and neat areas laid out in lawns are located to the front and sides of the property. ample paved driveway provides excellent car parking space.